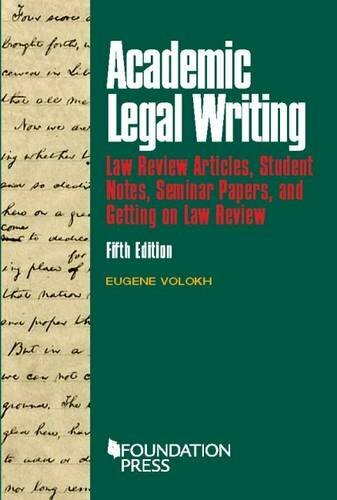 Designed to help law students write and publish articles, this text provides detailed instructions for every aspect of the law school writing, research, and publication process. Topics covered include law review articles and student notes, seminar term papers, how to shift from research to writing, cite-checking others’ work, publishing, and publicizing written works. With supporting documents available on http://volokh.com/writing, the book helps law students and everyone else involved in academic legal writing: professors save time and effort communicating basic points to students; law schools satisfy the American Bar Association’s second- and third-year writing requirements; and law reviews receive better notes from their staff. The Fifth Edition, based on the author’s experience teaching his newly designed Intensive Editing Workshop and First Amendment Amicus Brief Clinic, adds material on editing, rebutting counterarguments, writing strategy, identifying and using the key assets of the article, fighting “the curse of knowledge,” and submitting articles to law reviews. It also adds extra examples of sound writing, as well as editing exercises. If you have any questions about this product by Foundation Press, contact us by completing and submitting the form below. If you are looking for a specif part number, please include it with your message.